However, to successfully implement the tactical over the long term, it’s important to understand the strategic — how the tactics fit into a long-term strategy — which is why I will share both strategic concepts and tactical tips with you. recommending how you should think — how your brain should operate — is telling you what to do. Just because it’s mental doesn’t mean it’s unimportant. In fact, it’s absolutely critical that you take more mental action than physical action. The time you invest in reading this book is an investment in your career, your personal relationships, and your physical and mental well-being. Getting specific about the kind of life you want to have and the personal accomplishments you want to attain will help you to carefully guard your time. You must be conscious, aware, intentional, present, cognizant — whichever term you prefer to use — regarding your decisions about how you use your time. wiring in our brains that helped us to capture these ideas helps us to turn those random thoughts into focused goals. People who have goals succeed because they know where they’re going. It’s as simple as that. help your brain to maintain clarity and make better decisions about how to use your time. She needed to map out her plan of attack. She had to take her time in order to save time. 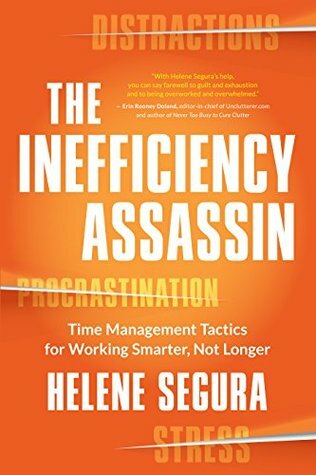 To reiterate (hint: I’m brainwashing you at this moment), we need to have structured systems, routines, and time blocks for completing work; yet we need to be able to adjust those systems, routines, and time blocks, and morph — move them around as needed — and still get everything done that we need to. It’s really important that we focus on the present, that we be intentional with everything we do. Schedule your high-value work tasks first — around your personal priorities — and spend at least 50 percent of your workday on them. There is time in the day to do what truly needs to get done. If you’re overscheduled and overwhelmed: • Break your tasks into smaller pieces. • Have mini-deadlines (or “completion dates” if you don’t like the word deadline) along the way for each of the pieces instead of one big one at the end. • Stop adding to your calendar until further notice. Cortisol has been found to cause high blood pressure, degeneration of cognitive functions, and weight gain, among other maladies. When these chemicals are released on a regular basis, it can also lead to kidney failure. Does what is being offered to you support your work priorities? Does what is being offered to you get you one step closer to your business targets? Can the completion of what is being offered to you happen without your sacrificing your personal priorities and targets? Generating revenue and/or making your boss happy should not come at a cost to your well-being. If doctors’ offices don’t handle emergencies, you probably don’t need to, either. If clients know ahead of time that you’ll acknowledge their issue within 24 hours, begin work on the issue within 72, and schedule a meeting within 7 to 10 days after that, they know up front what the expectations are, so they won’t hound you for a solution now.